What family holiday would be complete without a trip to the beach? 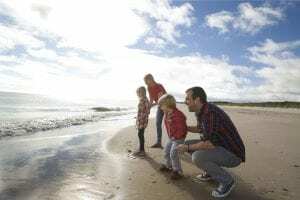 Rosslare Strand is the ideal destination with a claim to fame of being the sunniest spot in Ireland. Families can enjoy lots of activities on the long sandy beach which also boasts a Blue Flag. Dollar Bay and Booley Bay are off the beaten track a little but well worth finding. The beaches are less populated and perfect for families looking to enjoy sunbathing, surfing, swimming and fishing. Visitors are also permitted to bring a small BBQ along with them to cook on the beach.